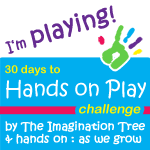 Have you checked the 30 Days to Hands on Play Challenge hosted by the two amazing bloggers - Hands On : As We Grow and The Imagination Tree. We are excited to play along, how about you? Mission Statement: As my little girl is growing big, I would love to spend quality time with her. I aspire to improve her reading, writing skills through fun learning and play. She is a very energetic and Bouncy girl. So she loves all the games and play that keep her moving.. tag, hide and seek, ball, Dancing to music, Race..
She loves open ended, imaginative, pretend play. She pretends to be Princess, Mommy/Daddy, Teacher, Big sister, Big brother, Rock star... Has lots of imaginary friends. Now a days, She has started to ask for one person crafts i.e. her own creativity. Equip her with craft supplies and she will come up with her own creations. Loves abstract art and Junk models.